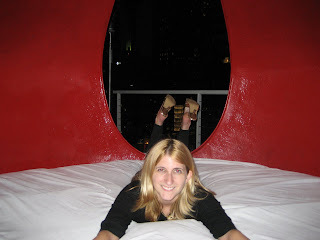 I've blogged before about the rooftop bar, the Standard Downtown, and how I once went into their pool with my skirt on, one tipsy night when I first moved to Los Angeles. Anyway, I went again the other night after work with a group of friends. 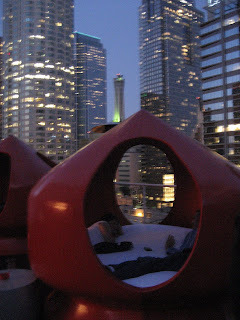 Besides the view, one of the best features of this lounge are their red water bed pods. They are these partially enclosed spade looking huts with a water bed inside. That looks like a lot of fun! And possibly naseating if too tipsy. How beautiful that shot of the swimming pool is...it takes your breath away. It definitely looks like a lot of fun, I'll have to remember it the next time Lo and I are in LA. okay seriously i am so jealous, haha. i was supposed to go to the standard on saturday but plans fell through. i missed out on water beds! the horror! so cute! i love DT!